Subhadra Raut, 50, still trembles while narrating a series of events that followed November 17, 2018. She had woken up to the news that tree cutters had already felled hundreds of trees in the forest which she considered to be her own child. Raut along with other villagers ran to the spot to confront the police and the administration. “Police hit me on the leg. I could not walk for over a week. But how could I stop protesting? This forest is my life. Ever since I came to the village after marriage, I have been protecting this forest with other villagers. My father-in-law taught me to consider the forest as my own child,” she says. Subhadra is a housewife from Balarampur village in Dhenkanal district of central Odisha. She is not an activist. None of the women from around 1,000 families who joined Subhadra on that fateful day were activists. The Odisha government’s decision to hand over about 12 acres of land from the Jhikargadi forest to P&A Bottlers Pvt Ltd — a Kolkata-based beer manufacturing company — forced them to hit the streets. 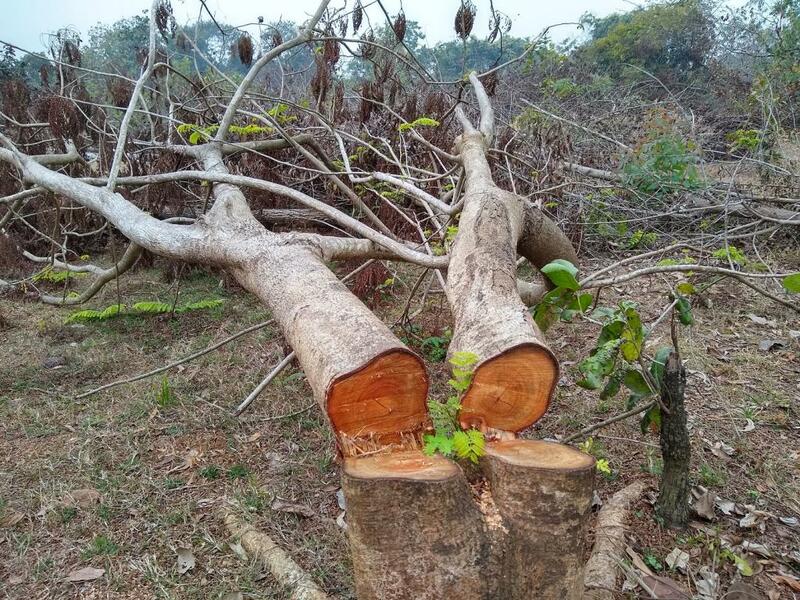 Two months later, hundreds of cut-trees are still lying in the forest after the apolitical people’s movement forced Odisha Chief Minister Naveen Patnaik to cancel the proposed project within days after laying the foundation stone. Since 1972, when the village committee took the resolution to adopt a part of the forest, expanding in over 243 hectares (ha) of land, and protect it, two persons from each family in rotation are sent to the forest to keep a vigil from morning till evening. They are supposed to keep track of any sign of timber smuggling or illegal activities in the forest — which is full of medicinal plants and trees such as sal, piyal, mahul and also a habitat for many wild animals. About 30 per cent of the population in Balarampur comprises of Schedule Caste and Scheduled Tribes. Many of these families’ livelihoods also depend on forest produce. The issue has been boiling since March 2016 when the village sarpanch (village head) gave a No Objection Certificate (NOC) to the local tehsildar (officer). Former sarpanch Biswajit Patra claims the decision to issue an NOC was taken at a panchayat meeting in the presence of ward members, however, a section of villagers refute this. “When I saw the minutes of the meeting in September 2016, I found that it was tampered with. The matter of NOC was included in it whereas we never discussed this in the said panchayat meeting,” says Jayanta Dhal, a former ward member. Interestingly, the villagers allege that well before the NOC-controversy the land was converted into fallow land from grazing land through a government order (RMC 270/2014, Khatian No. 449), way back in 2014. Later, it was handed over to the Industrial Development Corporation (IDCO) of Odisha and a part of the Jhinkargadi forest became part of the land bank to be utilised for industrialisation. The villagers moved the Odisha High Court appealing against the conversion of land in 2017. The court had asked for a status report from IDCO and the local tehsildar. Sushanta Kumar Dhal, secretary, Anchalik Suraksha and Bikash Manch, claims there was no further hearing in the court. Despite the villagers’ protest and several meetings with district officials as well as public hearings, the government proceeded with the industrial proposal. The government had allegedly defied an inspection report by the local forest range officer (FRO), Dhenkanal Range, dated January 29, 2018, that went against the project. “I inspected the project area…The area definitely looks like complete forest and not at all non-forest land,” says the report by the FRO to the district forest officer. District Forest Officer Sudarshan Patra claims that the FRO’s report was taken into consideration and the land earmarked for the Rs 102 crore bottling plant project was out of the forest land that was mentioned in his report. Apart from the forest, many other concerns were also raised by the villagers, including the depleting groundwater level, changing social fabric etc. “We had carried out an anti-liquor movement in our village. How could we allow a beer manufacturing unit to come up here? Moreover, there is water scarcity in the village every summer. The beer unit could dry up the underground water, causing more woes to the villagers,” says Ambika Prasad Jena, president of the Anchalik Surakhsha and Bikash Manch. Contradicting the Manch’s apprehensions, local sarpanch Moumita Manjari Patra claims that the original plan for the beer factory was to fetch water from Brahmani river which is about 10 kilometres away from Balarampur village. Moreover, a water supply project was very much in place in the village. On the day the administration came to chop off the trees, the women hugged the trees to prevent the officials — something similar to the Chipko Movement. The villagers’ determination might have halted the proposed beer plant, but there is no new plan for re-plantation of new trees. Criminal cases are still pending against 20 odd villagers who were protesting on the day. The fate of the logs is also unknown. The National Green Tribunal (NGT) prima facie found that the government has violated the provisions of the Forest Conservation Act, 1980. The Odisha government has failed to submit required documents to the NGT in its last hearing on January 21, 2019, prompting the bench to postpone the hearing till February 18, 2019. Sudarshan Patra says that since the matter is with the NGT, the administration is waiting for its order. Regarding the fate of the felled trees and the replantation drive, there has been no further government order or allocation in the budget. Sarpanch Moumita Manjari Patra further claims there are vested motives behind the protest. “Some people are trying to protect the illegal stone miners. The beer factory would have stopped these illegal activities,” she claims. The protesting villagers claim that stone mining activities are going on for a few years with proper permission and have no links to their movement. Locals believe that the present government halted the project ahead of the general elections. Any adverse publicity would hamper the electoral fortune of the Biju Janata Dal (BJD). As of now, about 1,000 trees have been lost. No new plantation has started yet and the villagers are apprehensive that some other project may return to their village unless the land is re-converted. The issue might have lost the media limelight, but the villagers are not going to give up so easily. “I was scared then. Now, I am brave. We are ready to fight till the matter is fully resolved. We have only one demand: give us our forest back,” says Subhadra as she and other villagers painfully look at the logs lying in Jhinkargadi forest.